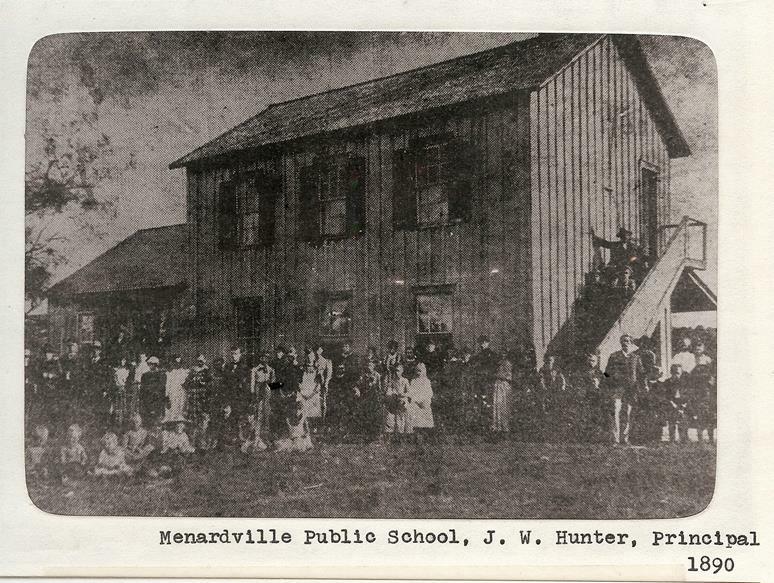 I am looking for an original of the below Menardville Public School photo. Earlier this week I was contacted by two different Menard folks hoping I might have a photo of the 1890 wooden Menardville School. John Warren Hunter was the principal. A lady had contacted them looking for the photo; she had the caption but no photo. This is the same location as the Menard Elementary and Junior High School in 2014. The Frontier Times magazine article says this wooden building was replaced around 1902 with a rock building. Here is the photo from the Don Wilkinson Collection and unfortunately the quality is not very good and looks to be from a newspaper article. Below you will see the “newly” found caption. It would be wonderful if we can find an original copy. Bottom row, left to right: Jimmie Bevans, Bart Bourland, George Wyatt, Bob Crawford, Gus Hunter, Joe Wilson, Jim Mann, Willie Strom, Tom Scruggs, Marvin Hunter, John Wilson, Wecka Mears, Willie Bevans, Dan Murray, Bob Russell, Ransom Moore. Second row, left to right: Jennie Russell, Maggie Bourland, MaryJane Wilkerson, Unknown, Unknown, Unknown, Ellen Wyatt, Gillie Somerville, Unknown, Ella Crawford, Annie Lou Mears, Annie Murray, Maggie Johnson, Louvina Somerville, Aunt Lula Maddox, Birdie Scruggs. Third Row (standing) left to right: Miss Alma Owens, assistant teacher; Cora Hunter, Emma Chisum, Ruth Moore, Annie Strom, Nellie Schuchard, Lovie Hunter, Natha Lewis, unknown, Mel Bradford (? ), Alma Gay, Unknown. Fourth row, (standing), left to right: Charlie Strom, unknown, Walter Mann, Frank Strom, Tom Russell, Clay Mann, Ed Mears, unknown, Nettie Wilson, unknown, unknown, Otto Rau, J. W. Hunter, principal; unknown. On stairway: Left to right: Max Russell, Judge J. D. Scruggs, unknown. 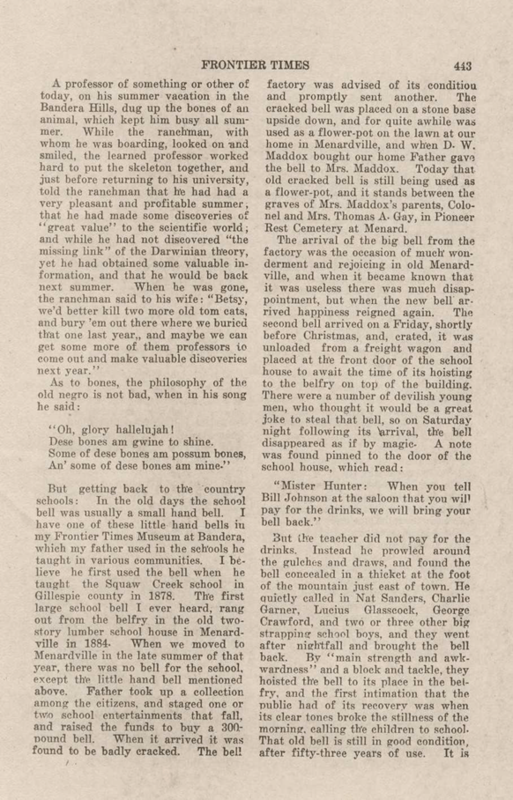 September 6, 1884, “Professor” John Warren Hunter, from Mason, opened the Menard school. While I’m not sure what this school was named, I found that it was originally located near the courthouse. One of the first schools, as remembered by some of the pioneers of Menard County, was a picket, one-room structure situated west of where the West Texas Utilities Company is now located. George Chew and Professor Nunley were among the first teachers. A few of the pioneers were taught under the massive burr oak tree which is still standing east of Menard in Sam Willman’s yard. At a later date, a lumber two-story building was erected on the location now occupied by the present Menard Grammar School. Dances were often held in this building. Messrs. E. V D. Stucken, Enoch Ballou and J. D. Scruggs were elected school trustees for this precinct recently. Prof. Hunter recently of Mason has arrived and will open his school today. He has flattering prospects for a fine school and comes here highly recommended. More about J. Marvin Hunter and family. EDITOR’S NOTE: This is the 175th of a series of articles marking Kerr County’s 2006 sesquicentennial. 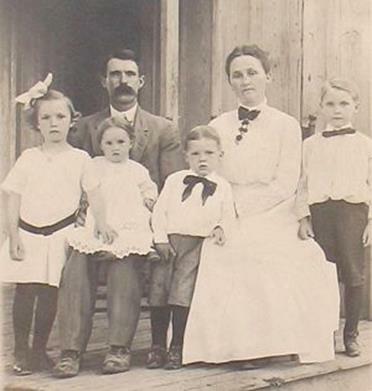 This photograph shows the family of J. Marvin Hunter and his wife, Susie Rogers, with their young family. Their children are, from left, Myra Jennette “Nettie,” Rachel, Jay Marvin, Jr. and John “Warren.” In his 64-year publishing career, he owned and/or published 16 newspapers, and printed numerous books and other historical publications. His legacy remains in Bandera housed at the Frontier Times Museum. As publisher, editor and/or owner of 16 newspapers across Texas and beyond, along with authoring many books, and a popular monthly magazine, few rural newspapermen rivaled John “Marvin” Hunter, Sr. (1880-1957) for prolific output. With a firm belief that better things were to be found over the next hill, Marvin had frequent bouts of wanderlust. He got ink in his blood at his father’s newspaper. Intense curiosity and boundless energy served him well to help small towns toot their horn. His friends included statesmen, professors, outlaws and lawmen. Marvin finally made Bandera, Texas his home, and left a permanent impression, seen today at the Frontier Times Museum. Many relatives, including Ruth Dewoody Hay and Joy Hickman Short Putnam, maintain his memory and admire all that he left behind. “Grandpa Hunter was a great promoter. He would come to a town, write stories about it, and would get it believing in itself,” Ruth said. Besides the 1953 Bandera Centennial special edition, probably his best known publication (and now sought-after) was Frontier Times Magazine, which debuted on Oct. 1, 1923. The magazine followed two earlier efforts, Hunter’s Magazine (co-founded with his father in 1910) and Hunter’s Frontier Magazine (1916). It was filled with tales of the wild and blood-thirsty frontier, often submitted by old-timers, alongside vivid photographs, images and graphics. In 1955 it was sold, and two years later it was a companion to True West magazine. Under various owners and editors, the magazine reappeared on and off until 1985. 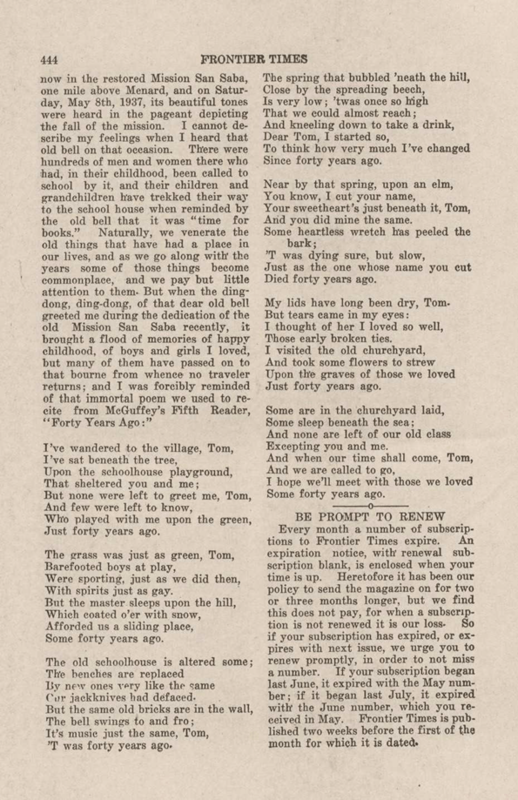 In his 64-year career, Marvin owned and published these papers: The Saturday Gazette and The Mason Spy in Mason, Texas, the Comfort Times, the Bland Herald and Carlsbad Headlight in New Mexico, the Menard County Enterprise, Kimble County Crony, Garden City Gazette, the Melvin Advocate, Harper Herald, Ozona Optimist, the Big Lake Crony, Sonora New Era, Bandera New Era and the Bandera Bulletin. He said that back in his Scottish and Irish roots, the Hunter family had intermarried with the Calhouns (first spelled Cohoon, then Colquhoon and Calhoon). In Colonial days, apparently, three Hunter brothers William, Jesse and James had come to America before the Revolutionary War. On the Warren side, a General Warren had fallen at the Battle of Bunker Hill, and in his honor, many descendants in Marvin’s family bore the Warren name. Marvin’s parents, John Warren Hunter and Mary Ann Calhoun, were first cousins. His paternal grandparents were Thomas Hunter and Jane Calhoun, who moved from Tennessee to Alabama. John was born in Rogersville, Ala. in 1846. 10 years later, his father moved to Texas and remarried. The family, which consisted of at least two other sons, Augustus Warren and James, came to Hunt County, and then to Hopkins County near Sulphur Bluff where they were farming when the Civil War broke out. Marvin said his father did not get along with the new stepmother so he took off on his own by age 15. John hauled cotton and freight with a mule train from North Texas to Brownsville, which had not been blockaded. His brother, James, joined the Confederates and served four years with Forrest’s Cavalry. Learning his parents had died, in 1868, John rode three weeks on horseback from Sulphur Springs to Troy, Tenn. There, he met Mary Ann who was well-educated, and whose parents objected to the illiterate “wild Texas boy.” They wed anyway and moved to Booneville, Ark. near James. John farmed on a rented patch of land, while Mary Ann taught, but after the crops failed, their lack of income prompted a new plan. Mary Ann taught John the ornate “Spencerian” handwriting method. He became proficient and engaged 11 students in a nearby community for a 10-day session, at $1 per student. Then, Mary Ann taught John reading and math, and he passed the the district school board examination and was qualified to teach third grade. They stayed in Booneville as the family grew. There were three daughters, Alice Carey, Cora Luby and Lillian Lenoir. Sadly, they lost a girl named Texas at 2 years old. Yearning for a more “pioneer” life, they relocated to Gillespie County in 1877 with a mere $4 in cash. However, he soon was hired to teach school in Spring Creek, Squaw Creek, Willow City and Loyal Valley. 1879 proved to be a bust for crops, so between school sessions, John hauled bones to Austin for $7 per ton, and then freighted 135 miles from Austin to Mason. The following March, Marvin was born, named for Methodist Bishop Marvin. Marvin may have inherited his itchy feet from his father, as the family moved again in the fall, this time to Voca in McCulloch County, where John taught. Three years later, they were at Camp San Saba. In 1884, they moved yet again, to Mason. Their home was formerly the Mason News-Item printing office, where little Marvin got his first taste of printers’ ink after upending an ink bucket over his head. “My good mother had a task getting me separated from that ink,” he wrote. Soon, though, they were in Menardville (now Menard), and by then another daughter, Mary Lois, had arrived. After being dismissed by two disgruntled trustees a year later, John took the family to Fort McKavett. Here, Marvin witnessed the killing of desperado John Vaden by bartender Ben Daniels. Years later, Daniels was appointed U.S. Marshal in Arizona and New Mexico by President Theodore Roosevelt. For a time, the family fluctuated between Mason and Menardville. 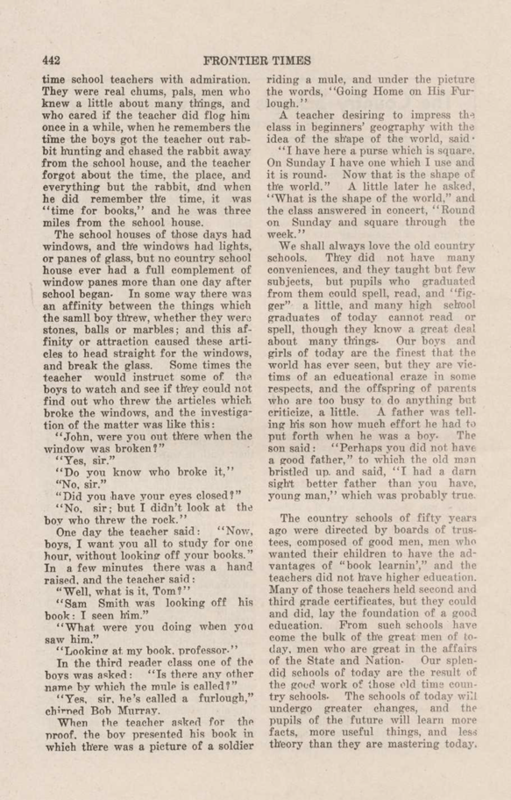 In 1891, John bought the Menardville Record and put Marvin to work, the beginning of his career. A year later, John established the Mason Herald, publishing it for 18 years. He first married Hattie Westerman who died shortly after they married in 1901. Two years later, he married Susie Rogers and they had four children: John Warren, Myra Jennette “Nettie,” Rachel, and Jay Marvin, Jr.
Marvin was involved in whatever community he lived. In Melvin, where he bought out the Melvin Rustler, he served as Justice of the Peace and postmaster. He joined fraternal organizations such as the Masons, Oddfellows and Woodmen of the World. But, above all those groups, he said faith in God was his standard. Ruth Hay, who came from Dilly, married Marvin’s grandson, Ray Marvin Hay in 1952. They met through Marilyn Hunter, her roommate at Texas State College for Women in Denton. Marilyn was Warren’s daughter, and Ray Marvin’s first cousin. His grandfather on the Hay side was the brother of Marilyn’s grandmother. Ray’s mother was Marvin’s daughter, Nettie. Incidentally, the Hay family had come to the area with the Lyman Wight Mormon Colony in 1854. After dating for two years, they wed. Ruth worked at the newspaper, too, when their only child, Tom, was little. She recalled that “Grandpa Hunter” typed with only the index and middle fingers of each hand. She also worked at the printing business, and learned to do many things. Then, Ruth began teaching math and physics at Bandera High School, which she continued for 13 years. She later returned to the Bulletin for two years, until the Hunters sold it. Ray Marvin volunteered as an EMT, in addition to his printing and newspaper businesses, Ruth said, which meant he often slept little. He was also the first mayor of Bandera to serve, but not the first mayor per se. Joy, who was born in Lockhart, was married to Bill Short, Rachel’s son, for 35 years, although they later divorced amicably. They met at Sul Ross University, married, and in 1950, moved to Bandera. They had five children, artist Susie, teacher Annette Lee, Les, a contractor, Clare Jill, who works at Bandera Electric Cooperative, and Jake, who’s in finance. She was the first licensed administrator of Hilltop Village Nursing Home. Joy also is an avid historian, with active memberships in the Daughters of the Republic of Texas, the United Daughters of the Confederacy, and the Kerr County Genealogical Society. She spends many hours volunteering at the Kerr Regional History Center. Ruth said that one of Marvin’s best friends was Noah Hamilton Rose. All of Marvin and Susie’s children learned about the business, and were trained as printers and newspaper workers. Nettie set type and was a reporter at the New Era. Rachel became an expert linotype operator and set all of the type on the weekly paper and the Frontier Times Magazine. In 1928, with his father’s help, Jay Marvin published the London Graphic, 24 years after Marvin first published it. Son Warren published the reincarnated Harper newspaper for 10 years. He became well-known in his own right as an artist. His first major painting, a herd of Longhorn cattle swimming across the Platte River, hangs at the Frontier Times Museum, and was done when Warren was only 13, according to an interview Marvin had with Bill Reddell in his San Antonio Express column, The Bill Board. “That boy was determined to become an artist,” Marvin told Reddell. “He had never seen a herd of longhorns nor the Platte. He had the scene described to him and started to work.” His first commissioned work, for which he got $50, was for John A. Miller, who said he’d pay for a good painting of a real Texas Longhorn. Warren replied that he was studying the muscles in the animal’s hind quarters. After publishing the Harper Herald his father had founded, Warren sold it and attended Chicago Art Institute. He became established as an artist, opening a studio in San Antonio’s La Villita section. In addition to the historical marker for the museum, Warren’s own was dedicated there last fall. In 1957, Marvin died in Kerrville after becoming ill while visiting a sister. The Frontier Times Museum, located on 13th Street, contains a diverse collection of about 40,000 artifacts everything from a South American child’s shrunken head and 400 bells, to many of Noah’s photographs of outlaws, lawmen and pioneers, reflecting the spirit of the Old West. It is open daily except Sunday, and admission prices are a bargain. Constructed from an attractive fieldstone, the museum opened on May 20, 1933, in the midst of the Great Depression. Marvin devised ingenious fundraising plans for the initial construction, and for later expansions, tied in with his books and newspaper. 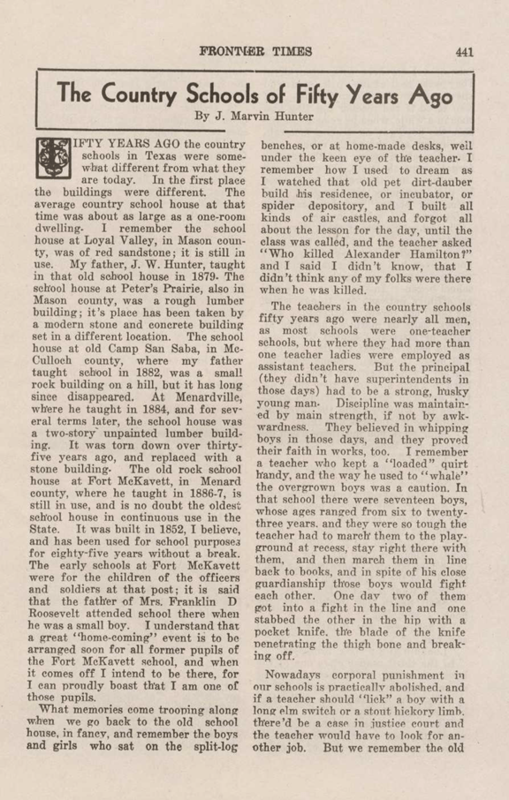 Below is from the July 1937 Frontier Times magazine; The Country Schools of Fifty Years Ago written by J. Marvin Hunter with great information about Menardville and Mr. Hunter.